In my case (and probably in yours), the negatives of many of these photographs are unavailable. So the only option is scanning the prints themselves. Removing the photos from the album pages before scanning them is time-consuming, and may even harm them. So your only option is photographing them individually, or whole-page scanning/photographing. Of these the latter is the fastest and easiest, since macro-photographs of single photographs is tricky in terms of lighting, focus, and framing. But here you run into another problem: you end up with tens to hundreds of scanned pages, each containing multiple distinct photographs. Unless you have the hand-eye coordination of a surgeon, most images will also be slightly skew. And even if the page is straight, individual photos may be skew relative to the page since they were glued that way. You could manually rotate, crop and save each photo, but this takes a loooot of time. So isn’t there an easier way? Of course there is! You’re not the first person who wants to do this. I wasn’t either – but it took me a bit of googling to find a good solution, and now I want to save you the trouble and share it with you. Photoshop is the first place where you would expect a solution to exist, since it is the veritable industry standard for photo editing and graphic design. This takes you to a directory browser dialog. Press “ok”, and you’ll see Photoshop run through each scanned image, cropping, rotating, and saving each individual photo into an automatically created subfolder with the name “Edited”. Generally Photoshop worked well, but also had several bloopers like the one above. You can see how it failed to split the three photos, while simultaneously cropping part of the adjacent photos into the output. Not good. The basic interface and functionality of GIMP is similar to Adobe Photoshop, although its multiple-window interface is a bit unusual and quirky compared to other mainstream Windows software. Standard GIMP doesn’t have a batch-cropping option, but you can install a plugin to automate this task. I’ll now show you how (fear not: it is quite easy). Download and install the latest version of GIMP (click here). Optional (and for Windows users only) : Download deskew.exe (click here) to GIMP’s plugin directory. Download DivideScannedImages_improved_v2.zip (click here). *If you want the old (obsolete) version of the script you can still be found here. Restart GIMP. You should now see the “Batch Divide Scanned Images…” option as a sub-menu under “Filters -> Batch Tools”. Click on it. “Selection Threshold” controls how sensitive the background color is defined in terms of separating it from the foreground photos. Play around!. Furthermore I changed the “Max number of items” specifies the maximum number of sub-photos can be detected on a single page. In our case no page contained more than 20 photos, so I set it to 20. Feel free to experiment with these settings. The “load from” directory should point to the folder of input scanned pages, and the “save directory” to an empty directory that will contain the output. Click on OK, and watch it run through all your photos. Comparing Photoshop with GIMP surprised me, in that GIMP’s filter seemed to be much more reliable, even straight out of the box. It is also possible to customise the filter’s behavior to suite your specific stack of scans. The scan / photograph borders should be cropped in such a way that it doesn’t extent beyond the page background, and the page background should extend up to or beyond the image borders e.g. – seeing the wooden floor (on which an album was placed while photographing it) will screw up the algorithm unless you carefully set up the “Background Sample X/Y offset” values. Good luck and feel free to comment on your experiences! 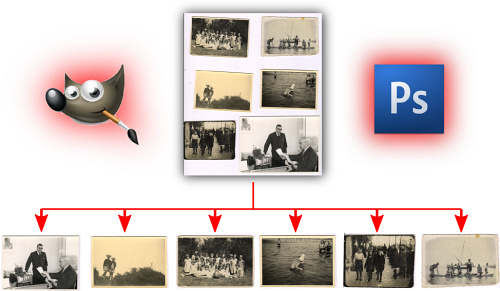 Thank you so much for this info…it’s exactly what I was needing for my old family photos. Great job! Thanks a lot! Very good tutorial on how to crop files! It saved a lot of hours! Worked great!! I’m really impressed. I was waiting to find a nice scanner at the office with a good paper feeder to do them all at once, but we never got one. This won’t be so bad this way, since I can do 5 photos at a time and the quality is great. Or use AutoSplitter, which is an automated, specialized tool for this very task! I have tried resinstalling the program and even tried installing older versions, none of which has fixed this problem. If anyone can help me with this I would be very grateful. You should maybe try a Gimp forum as well since this may be a general problem with Gimp? I’m having the same issue! Were you able to fix it? This happens if you try to drag and drop the deskew program into the plugin directory *onto* a file that already exists in there. If you look closely, it is trying to open deskew with that file, which you don’t want. Just copy and paste it and it’ll copy over fine. Workaround: copy all DLL files from \gimp\bin to the plugin folder. Where did you get the BatchCropStraighten script? I can’t find it. I link to it in my post. Is the link broken from your side? I have Photoshop CS5.1 and CS6. 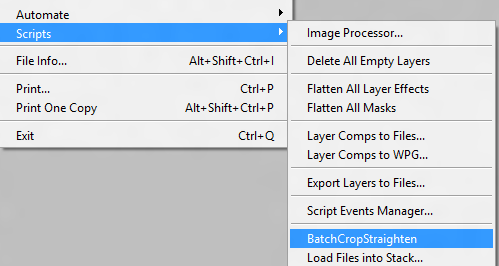 The function for BatchCropStraighten is not an option. Do you know why this might be so? Did you have to create this script yourself or…? Thank You.. Just tested it with GIMP 2 works like a breeze.. Really amazing as I have just moved to HP 8600 AIO from Canon and HP Software is useless…. I really like your tool you’ve setup here, but any chance it can be worked to open and save tiff files as well? Should be easy – Gimp can do TIFF also. Just a question of filtering for .tif and/or .tiff file names and choosing the output format. Hi Wilken. I’ve updated the script, DivideScannedImages.scm, so that you can load and save tiff files as well (requires the extension to be .tif with one f). Download it from the link in the post above and overwrite the old one on your machine. I’ve tested it on mine machine and works a charm. Thank you so Much!, Now I can figure out where I was going wrong in the coding as well! can you kindly help me out to have the same picture name after crop & straightening the picture? In you tool, after cropping & straitening, it does change the picture name as IMAGE00001, but I want it to be stay the same as it was original. Kindly advise on the solution. Thanks a lot for this post! The GIMP script works great… the perfect solution. Thanks!!!! It worked great after figuring out what settings worked best and where to put each photo on the scan so they are in order. I did have to install the 2.8.6 version of the main program to get it to work. For some reason the first download I did was 2.8.4. An excellent guide, but i need some book scans to be batch splited in the middle. How could i do this using Gimp? Hi I have a problem. When I save the picture, ilt,s in xcf files!! It is a very good tutorial for installation, thanks a lot. However, I am unable to alter the file extension type when saving the splitted images. For example, it is png when I use extract or extract to, and gimp when I yse save or save as. Is it correct? I have a peculiar problem with my photos here. But these photos were individually accessible even a few days ago from my pen drive. But, for now, if a particular photo is clicked for viewing the whole batch appears on screen. The entire batch looks clamped to one another & seems inseparable. I can send you the sample. That sounds like an issue with the image viewer you’re using, and is outside the scope of this blog post. Have you tried viewing your images using another viewer (like Irfanview)? The Concordia Lutheran Church Men’s Club will once again be selling Christmas trees and whaters this year. The tree lot is located at the Church-School, 4245 Lake Avenue. Christmas tree sales will begin on Friday, November 23rd. The lot will be open 12:00 a.m. to 9:00 p.m. daily, except Saturday mornings, when it opens at 9:00 a.m. The proceeds from this fund raiser are used to support various projects and functions of the Concordia Church and school. A selection can be made from Scotch Pine, White Pine, Douglas Fir, Fraser Fir, and Blue Spruce. These trees were just cut a couple of weeks ago. Please come see how fresh they are. Decorated and undecorated whaters are also available. Your patronage would be greatly appreciated. Many thanks Francois for sharing this very handy solution. Like the poster above I’ve recently bought a HP 8600 only to find it will no longer separate photos scanned via the flatbed. Your post has saved me a lot of messing about, thank you! Thank you for the great work!!! But I followed the instruction on my WIn7 virtual machine, but after click OK it did nothing but close the Batch dialog. Even can’t see the progress bar moving. Is there a log view where I can see if the script ran to check if anything went wrong? can this work on gimp mac? Haven’t tested it but it should work, yes! All seemed to work well, except that GIMP altered the DPI in all of my images. All of the images were scanned in at 600DPI. When GIMP did the auto-cropping procedure, it automatically converted all my photos to 72DPI. Fail! How can I retain the 600DPI? The dpi is just metadata, it doesn’t say anything about the digital resolution (number of pixels) of the image.You can always change the dpi (“pixels / inch”) without losing image information, by going to Image -> Print Size. Thanks for your insights – much appreciated. I’m a casual user of Photoshop although there’s nothing casual about that product. I never tried batch scanning, and we need it to speed-up capturing old photos. I was looking at new printers/scanners with this capability, and didn’t realize that software existed to do batch scans. I will try your suggestions. Also, it may be prudent for me to look at GIMP in the event Photoshop starts to frustrate me. The illustration is for Oz Squad and Oz Squad wasn’t (isn’t) for kids. At least not the under ten set. Despite its reauoptitn (and unlike many of the newer Oz continuations) the Oz in Oz Squad is actually a pretty cheerful place. That you recognized all but 3 characters is pretty good. Jenny (standing behind Nick) and Milo (standing between Jenny and the Wizard) haven’t seen print yet. Ozzy (between Dorothy and Ozma) made his debut in . I have no experience with GiMP. I’ve tried downloading this plugin before, and have gotten no where. With your instructions, I was able to at least make it to step 4. However, i don’t see “Batch Scan” or “Divide Scanned Image” under the filter tab after restarting the program. I can see the unzipped file (DivideScannedImages) in the file folder. Any ideas? Como o pessoal veste a casmia do software que usa como se fosse uma nacionalidade . Foi sc3b3 uma brincadeira, mas sempre vem os caras com essas guerrinhas. Windows x Linux, Java /.Net e Delphi. Android x iOS.Cada um usa o que quer, o que achar melhor e fim. Uso Linux em casa, Windows no trabalho e iOS no celular. Desenvolvo em Delphi e C# na empresa, em casa fico brincando no Java e no Php, se aparecer um proposta melhor pra desenvolver em Ruby ee estudo a linguagem e aprendo. Quando vejo pessoal discutindo, sem ser em tom de brincadeira, por essas ferramentas me dc3a1 um grande desc3a2nimo. c389 como se um pedreiro discutisse com outro qual marca de cimento c3a9 melhor. Seems to be a broken link to deskew. I opened GIMP as is and the scanning window opens as it did with my Epson printer, which is a nusiance, in that I have to reset it each time I scan. When I recently purchased this Epson printer, it replace the window I normally had in Photoshop Elements and now that same scanning window continues with GIMP, Is this normal for GIMP? I installed all plug ins etc., no problem. Set input and output folders, .jpgs in the correct folder, hit “OK”, but nothing happens. Am I missing something? I have not been able to download the deskew file. My virus checker states it is a threat and does not accept it. Any other sites to get it? Francois – Many thanks for this. I’m using this now and converting the thousands of scan pictures I’ve always wanted to crop. Ohhhhhhhhh, my word. Thank you SO MUCH, my sis is getting married and I batch scanned eight hundred billion photos from our family albums for a slide show to run in the background and HPs newest drivers no longer allow for the separating of photos from scans done on their overpriced printers. THIS saved my life. I am building web-site, dedicated for the aircrafts my father built in ~24 years… Most of the pictures are “on paper”… I was planning to scan them for years….And this instruction…. Well – simply saved the day ! The script works but the batch script doesn’t. It just closes. I couldn’t find a solution. I have solved the problem. The batch script doesn’t recognize ‘jpeg’ files. Adding ‘[e][E]’ in the script solved the problem. The conversation by using this filter is working perfect but the filter is changing the name of the file after conversion. Is there any solution to keep the same name of the file after cropping it? I just found this script just did the work for me! It automatically crop & straighten the photo and save each result to directory you specified. I have a Mac. I got the batch separator to open up, set up my folders to draw from and divide into, but when I click OK, nothing happens. I go into that destination folder and it is empty. Have I missed a step? I experimented with using singular photographs and the function seemed to work in the sense that they were cropped and transferred into the destination folder, but the scans of multiple pictures are not being divided nor transferred. Any ideas? @Stephanie I failed the first time. Then I just do it again, selecting the source folder and the destination folder, click ok then it should automatically open up each photo to do the crop and straighten and save. The crop and straighten is really not good option in Photoshop, I used both options the code you mentioned in the link and the GIMP. I lost important area of the pictures after using the crop code in PS and when I used GIMP, it is working perfect without any loss of the images. My issue is, I want to replace the same pictures which are using for the cropping with their original name. Currently gimp tool is generating its own serial number e.g IMAGE00001, but i want to save with original name. The beauty of the script is that we don’t have to MANUALLY naming those cropped files, so it speed up the whole process. If you want to rename it to original file in the process it will slow down a lot. Why don’t you find out those files you want to rename and do it manually after script is done if there aren’t lots of them? I need it to be done automatically as per the original name. Kindly advise on any solution. Thank you so much… you saved me so so much of my time and life!…i feel better …. Nicely written, made it seem do-able and it was! I highly recommend this! I am not alone with this problem. You are a hero man!! I got hundreds of photos to crop. Very difficult trying to integrate all these downloads. Can’t find where they are. However, when trying to open deskew.exe., an error message surfaces stating libgimp-2.0-0.dll is missing. I have searched and downloaded again the program and received the same message. If you follow the instructions exactly like I listed them it should work. You shouldn’t “open” deskew.exe, just save it in the correct folder as indicated. The magic happens in Gimp. Do you do need a particular photo scanner WITH CROPPING FUNCTION and what you recommend, or is just a software function? thank for your answer. Thank you very much, I am very impressed with the wase and the results! Wow man!!! this is AWESOME!!! thank you soooo much! That’s a way to do this on the command line, and it is quite easy to customize. For example, in my case the scanner imprinted a large shadow (30px wide) on one side of each scan. I changed multicrop to remove that border, and now it works like a charm. just wanted to let the fellows know that the canon’s CanoScan software has a mult-scan feature which separates the images automatically. fmalan, thank you for this tutorial!!! I was aware of the Photoshop feature for a long time, tried it several times and I gave up on using it cause it does not work properly. It is really a shame for Adobe, considering it is a part of Photoshop, which is a great software. After reading your post I decided to give the GIMP plugin a try (I had never heard about this plugin before). I did a quick test with 50 scanned photos and it was able to crop and skew all of them with only minor flaws (really really minor flaws). These were the same photos I tried on Photoshop, which gave me ridiculous results. I’m really impressed with the results. Considering it is 100% free solution, I’ll recommend this approach to everyone I know. The only thing I wanna point out, is the problem saving the images on 72 DPI. I know you already answered this question, and I agree with you, there is no loss on picture quality, but we lose an important data, the real size of the image. Is there any way to change the source code of the script to preserve the original DPI or at least create an Input variable allowing us to chose the desired DPI output? I appreciate your help! Thanks again. solved my problem, saving the images in 600 DPI instead of 72 DPI. You can put any number you want (remember to change both of the 600), to match with the input file. (bare in mind this will not improve or reduce the quality of the original image, the total amount of pixels will remains the same). If I have time I will create an input box to make things easier, instead of editing the source code. Any help with this issue will be appreciate. Super, thanks for the compliment and the tip! It is a good suggestion; I’ll see whether I can add that sometime. If you do it before I do, feel free to let me know! I don’t know how much of a programmer you are; I have put the script on github so you can do a “pull request” via that site if you’re faster than I am. Otherwise I will update the script over there when I change it. I’m trying the GIMP method. One thing I’m seeing is it doesn’t allow me to choose an individual file, only a folder from the “Load from” drop down. So, if I’ve already processed some scanned files and don’t move them out of that folder it will process them all over again when I run the batch for more files. Thank you! Worked perfectly the first time. I have an image of a bunch of postage stamps, each about an inch square, on a black background. There is plenty of contrast. No matter how I set the parameters, it just copies the entire image. Please suggest how to set the options. Thanks. Hey Bill – as a hack, can you try to take the negative of the image to make the background white, split it, and then convert it back to positive? (e.g. Irfanview does this easily and can also do it in batch mode). I figured out how to make it work, by trial and error. Love it. Now I’d like to be able to change the color it uses to fill the edges when it straightens images – it uses white – can I change that to black? Also, is there a way to make it follow a prescribed sequence – I’d like it to go across then down. It seems arbitrary now. Many thanks, an excellent tool! Hi Bill, would you mind sharing how you solved your problem with the stamp scanning as I would like to do the is well. It looks like it isn’t properly cropped after the deskew. What can I do about this? On the top you’ll see that there is a gray shadow / darker area that confuses the alignment and cropping. You can change the background threshold value? When I click on deskew.exe my PC says I cannot use that and to find something comparable. Hi Mary – that sounds like a strange thing… You’re not supposed to run deskew.exe manually yourself – this file is used by the Gimp script. Never mind,, it’s apparantly something in the input file created by my scanner. If I first flip the images by 90 or 180 degrees, GIMP corrects it perfectly. So I’m guessing there’s a thin line, which I don’t see but GIMP does, that’s confusing the script. Thanks for the great tuturial. How can I make this work without the deskew function? I have non-horizontal text and it is messing with the picture alignment. Also keeping the original filename would be great if possible. Could you please perhaps post a list of instructions for “dummies” like me. I’ve got a heap of pages I have scanned with four photos on each, and would love to be able to separate them. Thanks for the comment. I would love to, but currently really don’t have the time. I tried to make it simple, but it does unfortunately still require you to copy some files by hand to certain folders. For you the most time efficient solution would be to ask someone to help, in the mean time? Thank you very much for your clear advice and recommendations Francois. Its saved me from relying on my husband to sort everything out for me while also saving me a lifetime of scanning very old photographs separately to achieve the same result. This works like a charm thank you. Is there a way to automatically add a new border around the autodetected image? Is this a possibility? I am running both PS and GIMP. Your instructions were very clear and it worked a treat first time. I now hope to save a lot of time putting the rest of my family photos on my computer so that we can all share them. Thank you for your support and please keep helping us. I am going to bump up the request to add the ability to save the new filename based on the original filename. For me, I am trying to process a few thousand jpgs that are of a small ID photo scanned on a whole sheet of paper. Thanks for the suggestion. I would like to advertise that this plugin is available on Github, and I would welcome contributions! Great, I put a request there. Anyway, the gimp script is working like a charm, thank you ! As a note, if it can save time for anybody, I harshly modified the code in order to have the output folder to ALWAYS be the same as the input one (that’s what I wanted, for dozens of folders, so it was a waste of time to select the output each time). Just restart GIMP afterwards. I am having an issue with the dividescanned images. it only seems to detect the top image even tho there are distinct space beteen the photos. Downloaded GIMP 3 times and deskew twice. when I try to open deskew it says can’t open because libgimp -2.0-0,dll missing.. Earlier attempts listed a slightly different dll I think. Is there a fix. Running w8 with classic Shell. This looks like a warning to me, not a virus (e.g. : Norton doesn’t trust my website). Try this link: https://www.dropbox.com/s/mkapwlhcunrk127/deskew.zip?dl=0 and then unzip it. Hi! The GIMP one worked for me but Ive been having problems. 1) When Its dividing the pictures it is only getting only one ouf of four of the pictures. I set the Selection Threshold to 25 like as you did. Is it because I put the pictures right in the four corners of the scanner? Should the pictures not touch the walls of the scanner for a better performance? 2) It seems to get some of the other pictures but it is only getting a specific part of the picture. For example a picture of a baby. Only the baby’s bib is showing. I have spent 3-4 hours on this today and still cannot get this script to divide pictures from a scan. I scan white envelopes that have graphics on them and the background is black. I have played with all the settings (and it would be nice to find a description of each setting) and still the scan gets processed as one picture. The space between the 2 envelopes is usually 10-20cm. Any help with this or an alternative solution would be appreciated. Scanning many hundreds of family photos from 1909 to current … for my mom who is 89. This setup is a huge time saver, and no more tilted photos. Now she can see then on her large screen TV !! Viva GNU, Viva Gimp, Viva Open Source, and VIVA Francois !!! Is it better to use a digital camera (like EOS 600D for example) ? ANd then to put them on GIMP for scropping ? Your instructions are clear and easy to follow. Even though my computer hiccoughed a few times, everything works as described. Truly amazing. Many, many, many thanks. Dankie, Francois, jy is ‘n ster!! I tried running it on a large folder of images. It made it’s way through the first few, and then just stopped. Great work on the ones it managed, but no idea why it won’t go any further. Tried repeating. No luck. I appreciate your time and effort and very thankful to you for sharing with the community. Keep up the good work. Is there any way to run this from a command line? I’ve spent some time trying to figure out script fu, and I just can’t figure it out. Did a great job on separating the images, but it also saved the complete, original image in the output folder. Is it supposed to do that? hi, i just downloaded GIMP 2 for this windows 10 Laptop to help my dad with some images for his websites but need some help with the plugins. first, i don’t have a scripts folder, so i just created one in the gimp/2.0/ folder, and pasted the second script. How do I use deskew.exe? I copy and pasted it into the 2.0/plugins folder, try to run it, and it says some .dll files are missing. what to do? ScanSpeeder is a tool that will batch scan and automatically separate photos automatically. I used it to scan my entire family photo collection. Thank you! But, seriously? Right-click disabled on your page?? Care to explain? It’s a hell of an annoyance! It’s the WordPress template I use. You can still save using “Printscreen”. Or just print the page, right? Can you reenable it or do you feel it’s protecting from… something? I’m having a problem where it initially crops the image (usually aligned just fine) and then rotates it to add a quarter inch of white on one side. Is there a way to just disable the rotation aspect of the script? I’m ok with having to manually rotate those that are off by 90 degrees, but this 5-10 degrees being randomly added to 20% of my pictures is rough. The easiest option for you would be to delete the “deskew.exe” file. This should make the script skip the deskewing step. Thanks so much. Like everyone, I have thousands of photos to scan. Still trying to fathom out why one batch of 3 was separated and the other batch of 3 remains the same, as 3 on a page. Any ideas please? I’m not sure where my last post went! I think the info has been very helpful but wanted to know why, when I scanned 1 set of 3 photos it was separated correctly but another set of 3 kept them all in one file. Could you explain why this might be? I don’t know what happened to my last post! Anyway I though the information was very helpful but wanted to find out why, when I scanned a set of three photos they were separated correctly but when I scanned another three, it kept them all in one file. Could you advise why this might be? Probably the threshold value (or the background) was such that the algorithm couldn’t separate the images from the background properly. Try adjusting the threshold value. I followed all the instructions above, but do not see the batch tools under the filters. Am i missing something? Hi, I have tried adjusting the threshold values this way and that. There are 6 distinct images, all separated, on a white background. It’s still not separating them. Great post! I used Gimp nas as you said is a little bit tricky to set up the preferences in order to have a good result specially when the picture has hight definition and gets harder for the software to capture the background color. I used 400 for size threshold and worked well. Again, great post, thank you so much for your help! Hi there, I can’t seem to find that batchCropStraighten script in my menu? would you be able to send me a download link to it? I’ve found a threshold setting of 15 works reasonably well. You need to pay attention to where the background colour will be sampled – the script allows you to specify a location relative to one of the four corners of the image, but only up to 100px on delta x or y. Having said that, it seems that the offsets need to be greater than 15 for it to work. I suspect the issue is due to the script adding a 15px boarder to the image and not taking this into account by adjusting the background colour sampling locations. I downloaded the latest ver of Gimp and installed it and the filter too. I get an error message when it gets to saving the first of 3 images I scanned together. ( error while exicuting script_fudividescannerimages; error unknowm> ;17073748) arguement must be : pair. Whatever the heck that means! Could use a little help here. I am going to try to uninstall the latest version and install ver14 whilst I await a responce. Funny, most of the time people are asking me to help them with their computers, be it virus, malware, repairing system, or data recovery. Seems to do a lot, get a “selection to path” progress bar that takes a second or two to complete, but also get an error “corrupt JPEG data:  extraneous bytes before marker 0xd9” and then nothing is actually created, not in the folder i told it to create nor anywhere else. Love this. Saving me a lot of time and actually getting the job done. Thank you so much, this gimp plugin is amazing! I’m looking for a simmilar script and found your site.. So I’ll ask you if you don’t mind..
I’m currently on a “portrait” type project where we’re shooting A TON of people on light gray background. We do a full figure shot, both sides, half figure, a couple of closeups, etc, about 10-15 images per person. We use white seamless, but don’t light is, so it’s light gray and light gradient of the bottom. The thing that’s cousing me a lot of work is cropping the images in post. I usually end up with about 1000+ images that all need to be cropped, since I need a simmilar amount of negative space on all of them. So I was thinking, is there a way to automate this, some custom script for lightroom/photoshop? A script that would recognize the figure/content in the photo then ad x amount of margins (ie negative space), and auto crop the image, keeping the same 3:2 ratio. Any idea how I could do that the fastest & easiest way? Awesome programm, dude! Many thanks! Excellent tool – thank you. I wonder if you can help with some info. I’m trying to batch-convert hundreds of scanned square images that all have a black background I want removed. The defaults settings work well. But I’m still getting a very thin black line around each image. Some images are color, some are white. So the black line is noticeable when printing the converted images on while paper. I found increasing “Square border padding” increases the thickness of that black line. Therefore, being able to enter a negative number (-1, -2, etc.) would remove just a little more, thus removing the black line. Is there any possibility of you making that modification to the plugin? Here anyone is welcome to improve on it – you too! Want to try your hand at it? Huge thank you for setting up this tutorial. GIMP got the job done beautifully. Thanks so much! It did help me a lot! Hi, I’ve downloaded your latest version (V2) but it doesn’t appear to save as .tif files, or am I doing something wrong? I could not run the Deskew exe, said something about a missing dll? I am on Windows 10 upgrade from 8.1….I understand a lot but not a wiz on the computer. The old version of the scipt works just fine, but the latest version of the script fails to load in GIMP 2.8.20. I have win 10. Downloaded all the software noted above, had recommended photo separation. When entering the “OK” on Script FU, the operation goes thru a series. The results are “nothing”. There are no results. Tried to find a file that contained the results. There is no photo breakdown as shown at the top of this page. Great script, thank you for sharing! It would be useful to be able to save the file with a variation of the original filename. Any pointers how the script could be modified? Hi, same as “Vemon” in the thread I have downloaded version 2 from the blog post but only see options to save files as JPG and PNG, any suggestions? Hi Weeble. 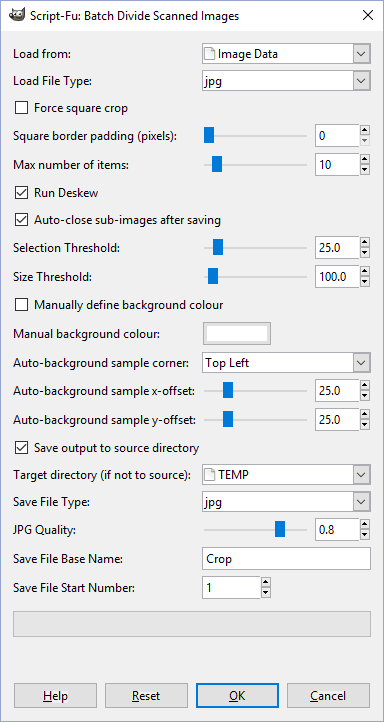 The script can import TIF, but only supports JPG and PNG as output formats. Why do you need TIF? You can always export to PNG and then batch convert to TIF. PNG uses 8bpp *lossless* compression – i.e. no loss in quality. I just ran my first batch and it was GLORIOUS! Exactly what I needed. Then I ran my second batch. Accidentally left a woodsy scene in the corner, the script split it into over 200 different images and began saving them to individual files. Got 10 saved before I could cancel the script. So when it sometimes screws up, it screws up spectacularly! Yes, I realize this was user error, not the script’s problem. I’m just enjoying having the time to be thankful on the internet because this has saved me SO MUCH TIME scanning family photos! Between Photoshop CC 2015 and GIMP, I found Photoshop to be more reliable and user-friendly – but not cheap. I also tested 3 iOS apps. IMO the best value was one called Pic Scanner Gold (https://itunes.apple.com/app/id1124131441), based on image resolution, splitting precision and extra features. My only gripe was lack of EXIF editor, but you can use other free apps for it. Great stuff, I tried all the other ones, ie:- Autosplitter, Ransen scan,vuescan,photoshop,Scanspeeder. Gimp is great & its free. The best one out of the others was Autosplitter as it fixed the colours at the same time but I found it a bit slow scanning. I made a mistake with Gimp at first by scanning & then trying to crop the photos & it didnt work. I then found I had to save the scanned photos first & then it worked perfectly. Seems this is working brilliantly for a lot of people. I wonder if anyone tried it with black and white (gray scale) photos? I tried the script on my scanned pages from an old photo album with black and white pictures, and it was rubbish. It would get the odd picture right, but for the most part it quite random. Didn’t see any responses to it working on the new Windows 10 platform. I’m new so haven’t even tried downloading yet but have read all the posts. Is there now a win 10 version? Will Gimp work with Win 10? Will Gimp work with Win 10? Anything special I need to know? WOW! This is great! Thanks so much for the very detailed directions including the specific path to the correct folder to put everything. I would have never known. Much, much appreciated! This is awesome, what a live saver, works like a charm and is Free!! Hi, I appreciate your tutorial. I have one question: I have to insert the images that I’ve separated into a pdf file where there are frames that I’ve pre-made. I want to put all those images in to the frames, which I want to set size so that I can print them out after and cut them into cards. Do you have any idea to automate this process? It takes me so long to drag each image in to the frame and resize it. Also the pdf format is so hard to manipulate but I don’t know which other software I can use to draw frames that I can define the size in centimeters. Is there a way to save images from left to right instead of the default right to left? I use it to crop scanned microfiches which have the orders from left to right. Easiest would be to do a horizontal flip on your input images, and then horizontally flip them back after cropping. You can easily batch-process this using e.g. Irfanview. I reinstalled copying script to the the gimp plugins folder, and then moved the images off the network drive to my local home folder. Now it seems to work, still it would be interesting to know what field or variable it is having this pair problem, as have noted it on 2 different Ubuntu installs 16.04 and 18.04. Otherwise it is a very fascinating piece of software that is even giving me good results with odd shaped objects. I want to automate the overall jpg-image scanning process by calling your script via command line at the end of the scanning step. Hours without result using the GIMP command line made me become desperate and now I just gave up. The script works well when being used inside GIMP. Do you have any idea or advise? The GIMP script is awesome. I have a slightly different problem, though. On several of the pages, there are hand-written captions that I’d like captured. Since the captions are written directly on the page background, they get cropped out. I’m exploring an ImageMagick script called “autotrim” right now (http://www.fmwconcepts.com/imagemagick/autotrim/index.php) but if you have any suggestions on what I should look at with this script as a workaround, that would be great. I’m guessing there’s something to be tried with selection and size thresholds, but I’m not really sure what those options do. This is going to save us so much work. Thank you! I downloaded deskew.exe and put it in the C:\Program Files\GIMP 2\lib\gimp\2.0\plug-ins and I’ve checked Deskew in the options, but my images are not being rotated, just cropped. Is there a way to confirm that it’s running deskew? Can I run deskew (from within Gimp) on its own, to make sure it’s working? I found the place to run deskew on its own (Layers->Transform) and it doesn’t seem to work for me. Bummer. I have scanned images with a single image (10×15 on a DIN-A4), but the script is committed to spliting the only image that appears. I just need the script to cut the only image that appears.